OXFORD, Miss. (AP) — Four players have been ejected from the Egg Bowl between Mississippi and Mississippi State after a fight at the end of the third quarter. 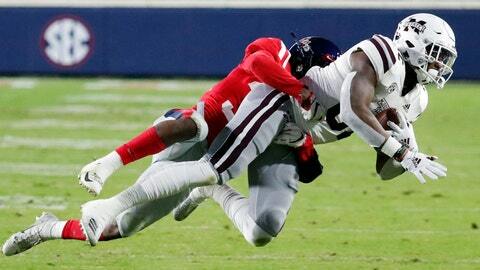 Ole Miss appeared to score a touchdown on the final play of the quarter Thursday night when A.J. Brown crossed the goal line. Players started shoving immediately after the play, and the fight spilled over across the end zone with several punches thrown. Both benches emptied onto the field before order was restored. Brown’s touchdown was called back because time had expired in the third quarter. No. 22 Mississippi State was leading 28-3 at the end of the period. Every player on both teams received an unsportsmanlike penalty. Mississippi State’s Willie Gay Jr., Jamal Peters and Cameron Dantzler, and Ole Miss’ C.J. Moore, were ejected. Gay was ejected because he already had one unsportsmanlike penalty earlier in the game.